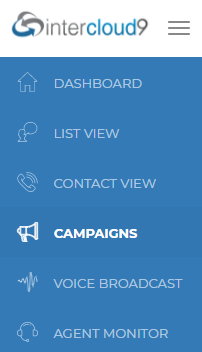 Name, Give your campaign a name. Caller ID Number, Number you want shown to callers. 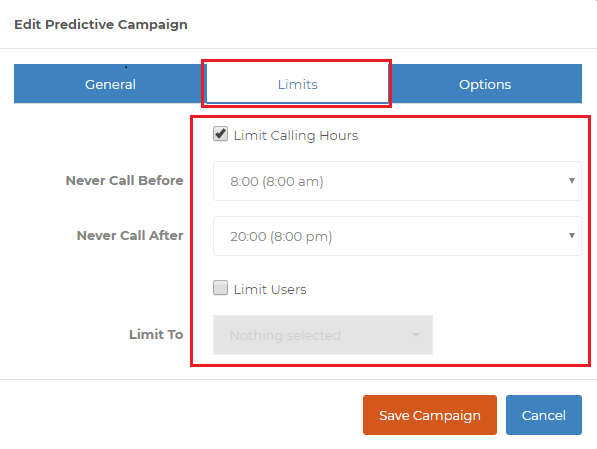 Limit Calling Hours, You can specify times in which you do not want the system to call a number outside of these hours. Dial Rate Override, *Note your Abandon Rate should not exceed 3-5% by law if it does you should reduce the amount of line you are using. 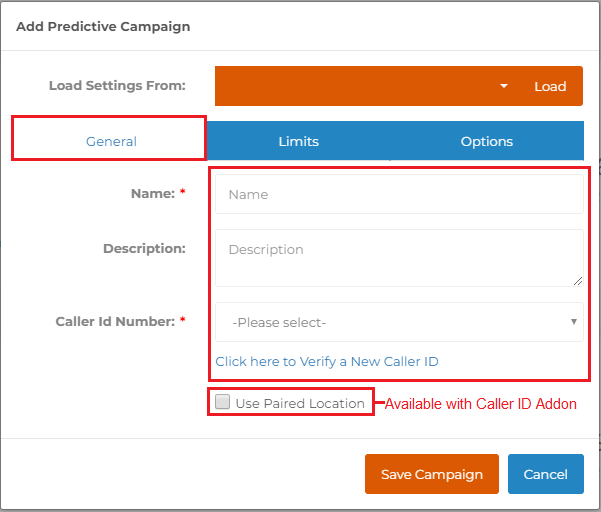 Select the desired amount of calls the dialer should make at a time, this selection is a ratio per agent joined to the campaign. Choosing higher lines is not always better, as the dialer will connect to more people then you or your agents can talk to. When that happens people will answer and you are not available or the call will be bridged seconds to late and you will hear dead air on your side because the caller has just hung up. The Auto option is a true predictive algorithm that automatically adjusts the lines up or down to keep the abandon rate under 3%. 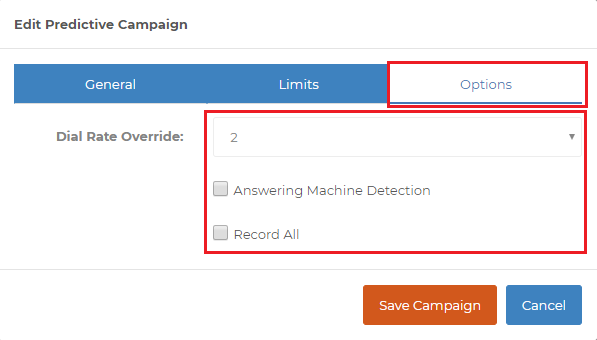 This feature is only useful with 3 or more active agents on the same campaign at the same time, otherwise dialer just dials 1 number at a time. The Inbound option will make no out bound calls however can can still make Manual calls out from that campaign. AMD, (Answering Machine Detection) do not use this function when calling businesses. This is due to the fact that most businesses answer the phone with an introduction rather than "Hello" confusing the auto dialer as an answering machine pick up. The AMD feature works best when calling consumers who answer with and expected "Hello" then pausing for a response. When calling consumers function will also add a 1-2 second delay before bridging the caller with the agent. The reason for this is the system listens for that brief pause in the answer, if it detects the pause it will then bridge the call with the agent. If there is no pause the system will conclude its and answering machine and skip over the call. If you want no pause or delay then do not enable the AMD and this will allow the system to connect the caller immediately. 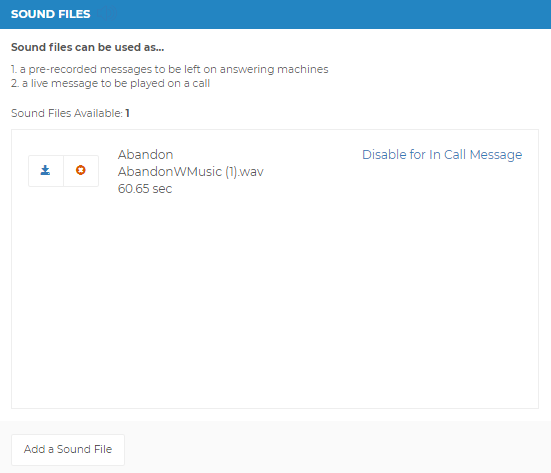 Upload or record your Abandonment message (this is the message customers will hear if no representative is available to take the call when it's connected). Customers will be disconnected after the established "Wait for Agent" time has expired as set in campaign options above. 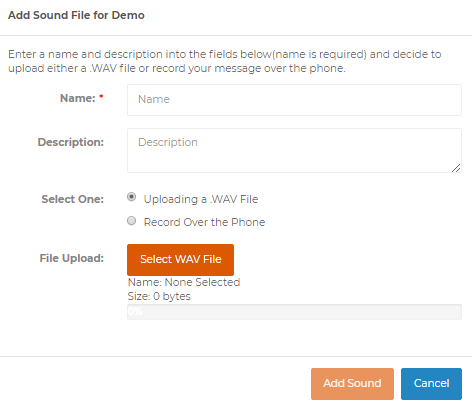 You can download a generic abandonment message by clicking here or record your own and upload it as a .wav file. 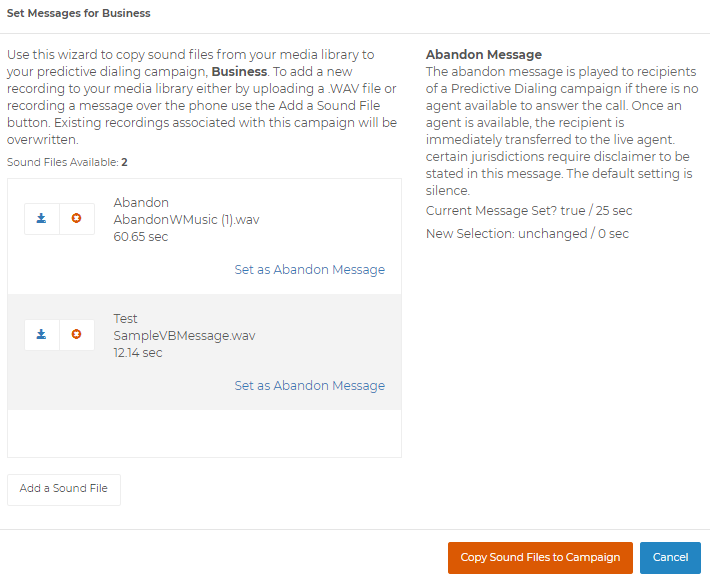 Now set the default "Abandonment Message"
Click the blue like that says "Set as Abandon Message"
Click "Copy Sounds Files to Campaign"